With my holiday a mere month away - and a day but who's counting - it's time to sort out my stuff and decide on what I'm actually going to take. And let me tell you, for someone who excessively over packs, this is a tough one. Amidst the different pairs of bikini (even though I will most likely stick to only wearing one), roughly ten very similar dresses (out of which 6 will return unused) and the many pairs of shoes (Havaianas will miraculously go with any outfit), I have to leave room for my poolside essentials. And I call these poolside essentials because I am much more of a pool kinda girl than a beach bunny. Don't get me wrong, I love exploring and finding new beaches but the mixture of being wet and sand doesn't appeal to me in the slightest so thank goodness for the swimming pool in the villa we rented out; if you need me I will be lazing around there in my pretty flamingo floater. Here's what I'm taking to make sunbathing time more fun and fashionable! Let's start with this cute Primark Slogan Straw Hat which I picked up on sale for a tiny price of £2 - as if Primark wasn't cheap enough. I had seen this a few weeks before I bought it but when I went back for it, it was gone. And because I never give up, third time round did it and there it was, the last piece waiting for me! Slogan straw floppy hats are hugely popular this year and have become the staple holiday accessory, but these can come with a pretty hefty price tag especially for a hat so gotta love Primark for bringing trendy key pieces for a fraction of the price! Next up, my gorgeous Ray-Ban Round Metal Sunglasses (£125) which I hadn't realised before but everyone has! The round shape screams summer and even though I will be taking a few other pairs too (especially cheapy ones to go into the sea with), I can already see myself wearing this a whole bunch so expect lots of poolside selfies. To keep cool and hydrated, this gorgeous bkr Holiday Water Bottle* (£25) will definitely come in handy and I have Farfetch to thank for it. bkr Holiday has a soft vacation green design which has been inspired by reading Vogue by the sea and paperbacks by the pool, which sounds exactly like what I will be doing! Expertly crafted with BPA and Phthalate free glass, this water bottle is designed with a non-spill opening for perfect sipping and an innovative cap for easy transportation. Holiday perfect am I right?! 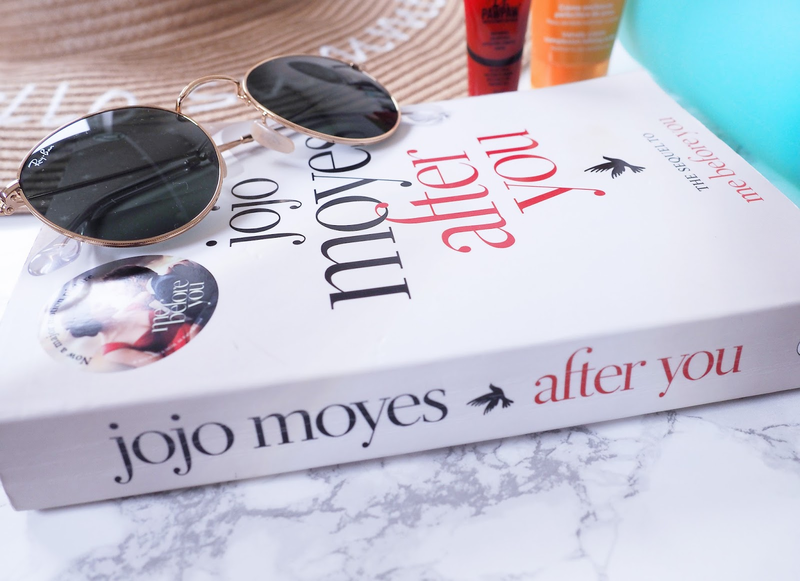 Speaking of reading, one can never really travel without a good book and the one I chose is the sequel to Me Before You, which I loved so I’m pretty excited to see what happens in After You (£7.99). Did you read the first one or see the movie? I’d love to know what you thought! And because sun protection is a must when you're as pale as a ghost, SPF50 is what I will be sticking to. 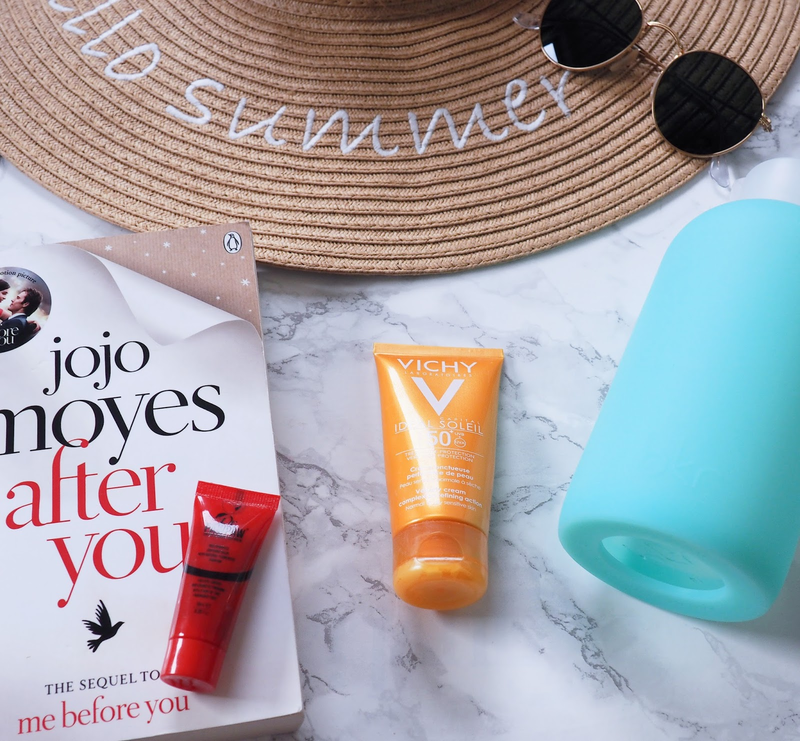 Vichy Ideal Soleil Mattifying Face Dry Touch SPF50+ (£16.50) has been my holiday go-to for about 3 years now and I can't fault it. Expert sun protection for normal-combination skin, high protection from UV rays and a mattifying effect against shine with a dry touch texture sounds perfect, and it is! Similarly, to protect my lips from being burned and chapped whilst on holiday and save me from having to wear lipstick to add a bit of colour, Dr Paw Paw Tinted Ultimate Red Multipurpose Balm (£6.95) is incredibly handy. It adds a natural glow to the cheeks and eyelids, is rich in antioxidants, minerals and also contains vitamins C and B to aid skin repair and add moisture. Tell me, what are your beach holiday essentials? What do you think of mine? Let me know below! Thanks for reading beauties and wishing us all a beautiful week ahead! I've been living a lie, thought that book was called ME After You not just After You haha, my essentials are pretty similar, enjoy your holiday! SPF, of course, and a hat. My iPad which holds all my books and then a cold drink. Enjoy your holiday! Aww Portugal. Can't wait to hear what it's like as I will be visiting I'm November. These are some great poolside items. That hat is great and such a bargain. Good ol' Primark. 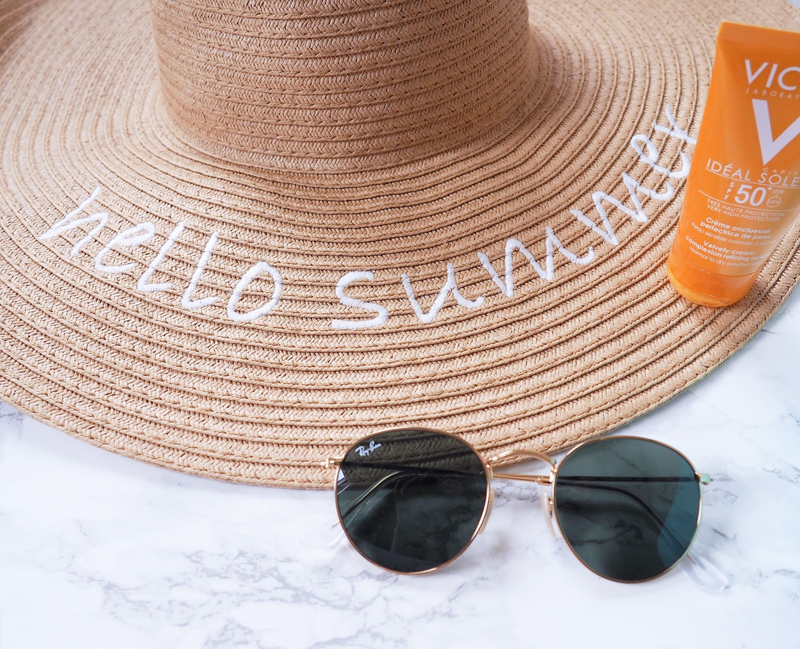 This sunhat is so cute <3 Will surely checkout the Vichy sunscreen :) Great post! Great post! I love the sunglasses! I've used Vichy sunscreen before and I loved it, gives full protection. I love your picks, thanks for sharing. Have a great Monday! I haven't gone to the beach at all this Summer but maybe this weekend when it's supposedly super hot where I live! SPF, sunglasses and cold beer are a must for me...no book though, need to keep my eyes on a very active two year old. Love the hat! So cute. Aqui estamos no inverno e mal posso esperar pelo verão. Adorei os seus preferidos e as dicas! That's a fab hat! I always have my SPF beautiful sunnies and a good book! My essentials are mostly SPF, hat, lip balm and water. I'm on Snapchat last 2 months or so but never used it. I will add you sweetie. Your glasses and hat are so cool! I have the same essentials plus after sun and headphones. I always over pack as well but a sun hat, sunscreen, good book and my ray-bans are always on the list!! Awesome post! I've been wanting one of those embroidered hats! Oh you must be so excited! And don't worry about the overpacking; packing is an art we learn to master, haha. Your poolside essentials are so on point. The slogan straw floppy hat is not only a poolside essential but also an Instagram must for summertime! 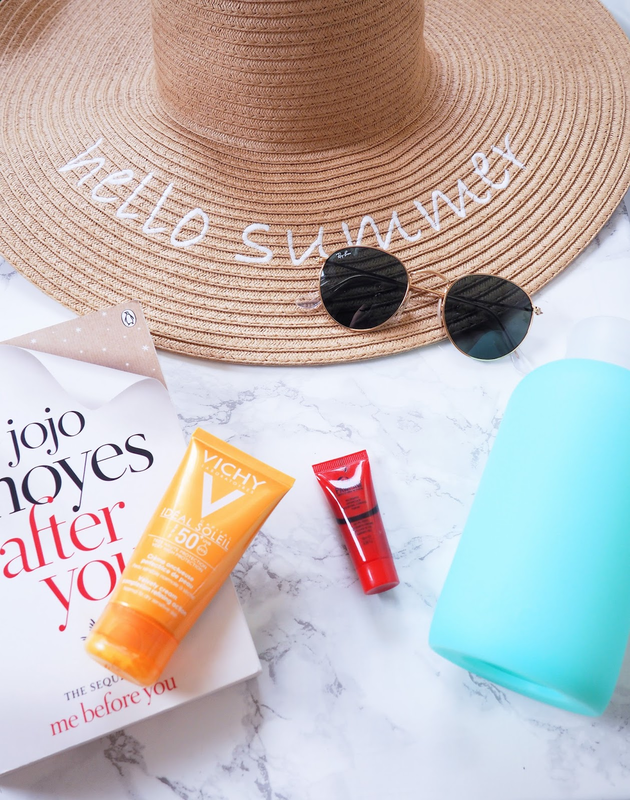 ;) I'm taking note of the Vichy sunscreen because it sounds amazing! Gosto dos produtos da Vichy. These picks are definitively super important to chill around at the pool :) I have the same sun cream and I absolutely love it! This hat is so great too - perfect to protect your hair and face. okay, I need to go to primarkt immediately to catch up that hat :D it's such a good bargain and it looks sooo cute *_* I just need to get it :D you know I love cute hats :D to keep the skin hydrated is so important *_* Love all of your finds here pam :) When are you going on vacay? Great choices - I can't go anywhere without a good book. Have a great vacation! I'm reading that book as well! Those are my dream sunglasses! I loved the hat, dear Pam! I also like Vichy very much! SOmething nice to read also belongs to vacations! So, in some weeks you will be holidaying, this is great! I like pools and beaches, but you are so right - walking or discovering a beach is more my thing, although I can bathe in both ways - beaches and pools! Hope you have a lovely week! Of course, a hat, glasses and a good book to hide behind! Sun protection as well!